A case report describes an acute allergic contact dermatitis (ACD) to Mastisol® following foot surgery. 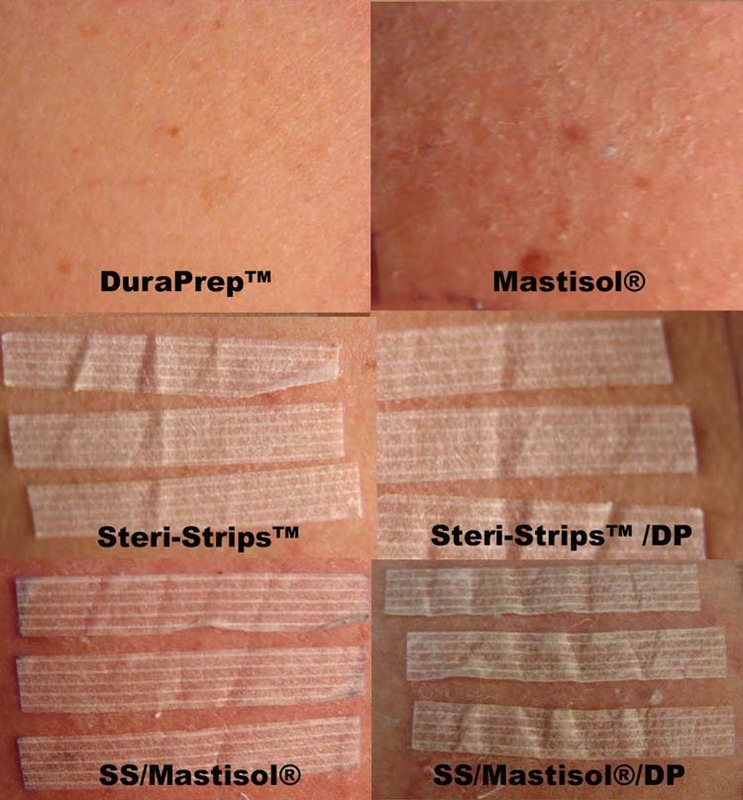 A patch test was used to determine whether the patient was allergic to the DuraPrep™ skin prep, Steri-Strips™ or Mastisol® skin adhesive. Reaction to all patch sites with Mastisol® was observed. The contact allergy resolved within 3 to 5 days after starting oral Benadryl®, Medrol® and topical saline compresses. Initial presentation, patch testing and treatments are presented. 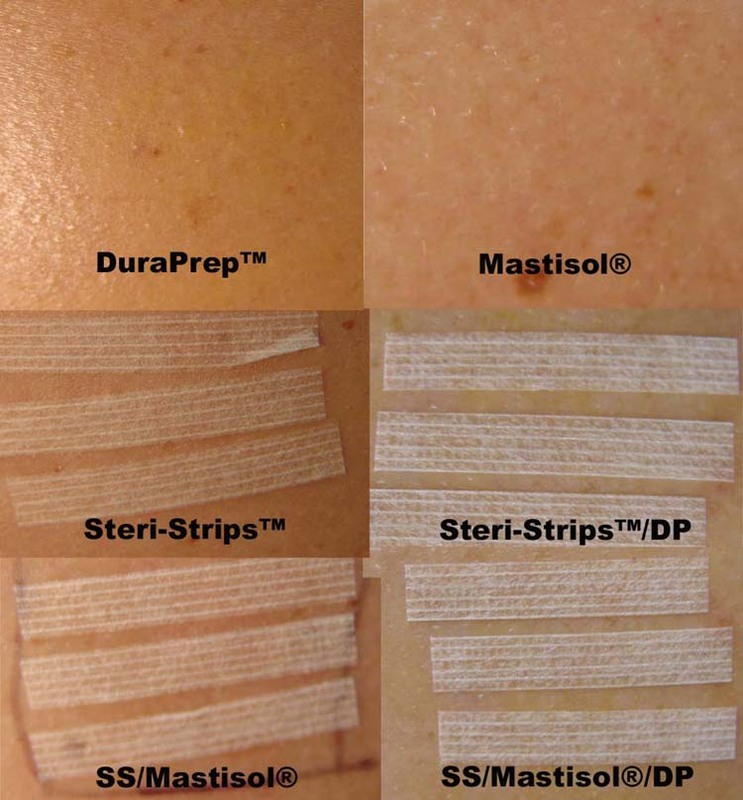 Mastisol® liquid is a clear, non-irritating, non-water soluble, latex-free skin adhesive frequently used in surgery to secure skin strips for incision approximation and closure. It is produced and sold by Ferndale Laboratories of Ferndale, Michigan. 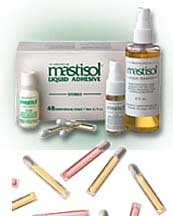 Ferndale laboratories have provided Mastisol® since 1963 as a surgical adhesive. (Fig.1) The product is sold in 2/3 cc vials, 15mL and 2 oz. bottles and a 15mL spray bottle. Mastisol® contains Gum Mastic, Styrax liquid, methyl salicylate and alcohol (SDA 23A). The Gum Mastic and Sytrax liquid provides the tackiness and resin-like properties to the liquid. A case report is presented describing a contact allergy reaction to Mastisol®. A 37 year old female underwent foot surgery without a history of previous contact allergy. The patient has drug allergies to penicillin and sulfa drugs. She also has a history of childhood asthma. One day after surgery, the patient called our office to report itching and redness to the foot. Figures 2 Acute contact dermatitis (ACD) following use of Mastisol® liquid adhesive. Figure 3 The contact allergy subsided and resolved in 3-5 days. Oral Benadryl®, Medrol Dosepak® and topical saline compresses were ordered. The blistering, acute erythema and pruritus have now resolved. In order to determine the contact allergen causing the contact dermatitis, a patch test was performed the following week. Six sites were prepared to the patient’s back. (Table 1) Before applying the contact solutions, the back was cleansed with alcohol. Table 1 All patch sites containing Mastisol® were reactive. The six sites are listed in Table 1 and shown in Figures 4abc. Within 24 hours, the patient reported considerable ‘itching’ to the back with increased erythema, edema and weeping to the sites containing the Mastisol® skin adhesive. The sites combining the Mastisol® with the occlusive strips appeared to be more acute in nature. The sites containing only DuraPrep™ and the Steri-Strips™ were non-reactive. The same treatment protocol was prescribed with resolution of the allergy within five days. Figures 4a The 6 test patch sites are shown here at initial application. Figures 4b These are the same 6 test patch sites after 24 hours. Notice that all the patch sites containing Mastisol® are reactive. Figures 4c The 6 patch test sites are shown after the patches are removed. The sites are cleansed with saline and alcohol. The patient is then placed on diphenhydramine and Medrol®. This reaction subsided in about 3 to 5 days. In this case, the patient experienced an acute contact allergy or contact dermatitis. The contact allergens suspected include the DuraPrep™ solution, Mastisol® adhesive and steri-strip adhesive. The Monocryl™ and Prolene® were not suspected as causing the allergy. The patch testing confirmed our diagnosis of Mastisol® allergy. All sites (sites 2,4 and 6) containing the Mastisol® were reactive. The patches were left in place approximately 24 hours, but the patient began to have irritation within 2-4 hours of patch placement. The itching and redness was quite intense. Once the tapes and solution was removed, the patient was placed on diphenhydramine and Medrol® and the reaction began to subside. Treatment protocol can vary. In milder cases of contact dermatitis, cool and warm compresses can be used. Aluminum acetate (Burow tablets) can be dissolved in water (1:40) and applied as a cool compress to give a soothing effect. Soaking the foot in Domeboro® tablets mixed with water is also acceptable. Steroids such as Medrol® and prednisone are used in severe allergic reactions. In acute ACD there is marked edema and bullae. In rare cases, these bullae can get secondarily infected. Oral and systemic antibiotics are rarely required unless a secondary infection is suspected. Topical steroid creams are mentioned in the literature, but appear to be used more for the chronic forms of dermatitis. Reports of skin allergy to Mastisol® appear to be under reported or very rare in the literature. The contact allergen could be the gum mastic, Styrax liquid or methyl salicylate. In an immediate contact allergy, when the skin is sensitized, the mast cells of the skin release histamine allowing the blood vessels to become porous. This allows fluid to accumulate in the tissues causing the tissues to weep and become swollen. The accumulation of fluid and resulting tissue edema, commonly known as a hive, also sensitize nerve endings and causes pain and pruritus or severe itching. If regions of the skin become reddened and the hives coalesce, it is termed a wheal. When this condition affects small areas of the skin, it is called utricaria. In larger regions of the skin or whole extremities, it is called angioedema. Treatment using oral antihistamine and steroid is simple, non-life threatening and effective in every case. Certainly, if a patient is sensitive to tapes or adhesives, the product should be avoided. The patch test can be performed to determine allergy to a variety of contact allergens. 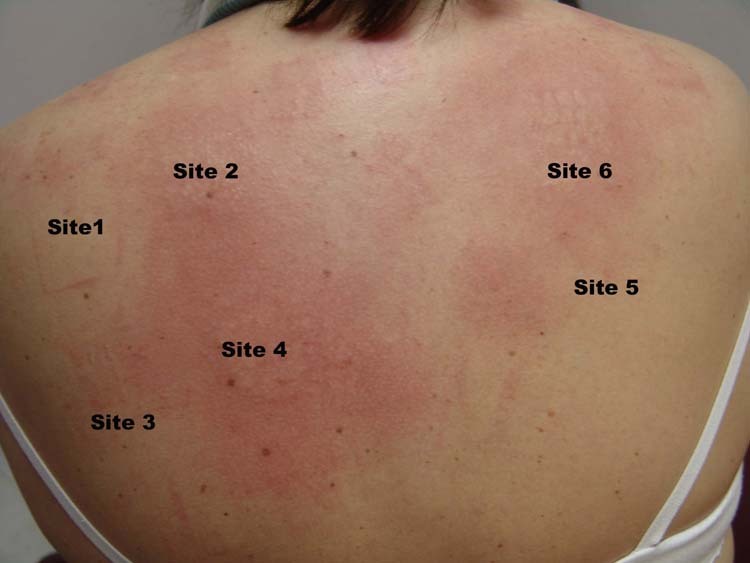 In this case, the patch test confirmed the diagnosis of contact allergy to Mastisol®. 1. Mastisol®, Ferndale Laboratories, Inc. Online product description. 3. Family Practice Notebook: Allergy Screening, [online]. 4. Michael, J.A. : Contact Dermatitis, eMedicine, 2005. [online]. 5. Mabrie, D.C., Papel, I.D. : An Unexpected Occurrence of Acute Contact Dermatitis During Rhinoplasty. Arch Facial Plast Surg. Vol 1, No. 4, pp. 320-321, 1999. 1 Private practice, Podiatry Staff, Doctors Regional Medical Center. Corpus Christi, Texas, 78411. This entry was posted in Uncategorized and tagged ACD, Allergic contact dermatitis, Benadryl, DuraPrep, Mastisol Allergy, Skin Allergy, Steri-Strips, Uncategorized. Bookmark the permalink.